The Soundmaster TR410GR portable radio catches the eye with its unusual design—a mix of retro and modern. Hidden under the stylish radio housing with its convenient carrying handle is a powerful AM/FM radio receiver (transistor radio). The solid knob on the front of the housing offers precise manual station adjustment. The telescoping antenna ensures excellent reception quality, even indoors. The sound quality of the compact radio impresses from the very first note. The radio can also run on batteries, which makes it the perfect compact companion for traveling, camping, and much more. 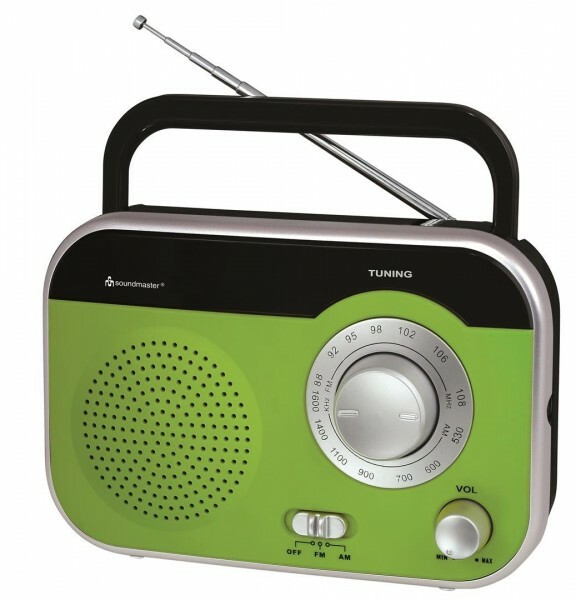 With the TR410, the renowned radio manufacturer Soundmaster has designed a delightfully useful device at a great price. The portable radio is also available in black (TR410SW), blue (TR410BL), and white (TR410WS).